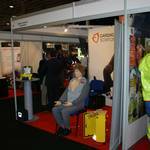 mannequin-man performing as Danny CPR training Dummy Manikin at training exercises and events. 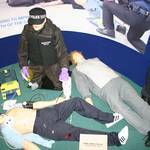 After some basic life support training, don't you wish the cpr dummy could tell you how it was treated; for example, was the circulation cut off to a limb while being rolled into the recovery position? 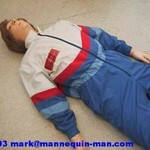 Now you can with mannequin-man as a "danny cpr resuscitation dummy". 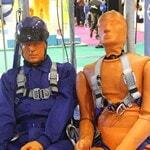 Mannequin-man will act like a cpr dummy for the whole training exercise or exam, and then give feedback at the end. The cpr dummy will have a real pulse, and will be breathing (although non-breathing can be simulated). 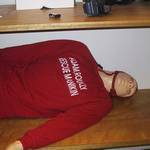 The cpr dummy has a false chest piece so chest compressions can be performed without any risk. 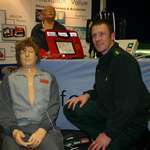 If you have a show or event where you need to demonstrate some equipment or procedure, and having a living cpr dummy would add extra interest, then please contact me to discuss.